This book is a response to the burgeoning interest in cultural tourism and the associated need for a coherently theorized approach for understanding the practices that such an interest creates. Cultural tourism has become an important and popular aspect of contemporary tourism studies, as well as providing a rich seam of upscale product development opportunities in the industry as a whole. Much of the related literature, however, focuses upon describing and categorizing cultural tourism from a supply-side perspective. This has prompted the taxonomizing of cultural tourists on the basis of their level of involvement and interest in cultural tourism products and/or their economic worth as a sought after market segment. There have been few recent attempts at a rigorous re-theorization of the issues beyond conventional representational theories; this book aims to fill that void. This groundbreaking volume provides a theoretical and empirical account of what it means to be a cultural or heritage tourist. It achieves this by exploring the interactions of people with places, spaces, intangible heritage and ways of life, not as linear alignments but as seductive `moments' of encounter, engagement, performance and meaning-making, which are constitutive of cultural experience in its broadest sense. The book further explores encounters in cultural tourism as events that capture and constitute important social relations involving power and authority, self-consciousness and social position, gender and space, history and the present. It also explores the consequences these insights have for our understanding of culture and heritage and its management in the context of tourist activity. 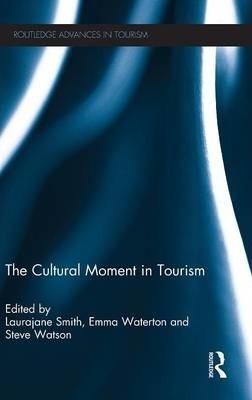 In capturing the `cultural moment', this book provides a better understanding of the motivations, on-site activities, meaning constructions and other cultural work done by both tourists and tourist operators. The volume confronts and explores the cultural, political and economical interrelations between culture, heritage and the tourism industry. In so doing, it also investigates how this co-mingling of identity, representation and social life may be better apprehended with the wider shift in critical thought towards notions of affect and performativity. The book is a fundamental and influential contribution to research in this field. It will be of significant value to students, academics and researchers interested in this broad topic area. Laurajane Smith is a future fellow at the Australian National University, having moved back to Australia in 2010 after over nine years at the University of York, UK. Emma Waterton lectures in heritage and tourism at the University of Western Sydney, Australia. Steve Watson is a Principal Lecturer at York St John University, UK, where he teaches courses on consumer culture, tourism and heritage.